Earlier this week, Microsoft announced that Dolby Atmos surround sound support was coming to the Xbox One — but only for Blu-ray playback, and only for those enrolled in the console’s preview program. Today, though, the company says that it’ll soon offer full Dolby Atmos support for games on both the Xbox One and in Windows 10. For best performance, you’ll need a pretty serious high-end speaker setup that supports Atmos. But Microsoft notes that you can use “virtually any pair of headphones” to get a similar experience. And Atmos isn’t limited to games — Microsoft also notes that it’ll work with films as well, assuming the movie’s audio was mixed with Atmos in mind. As for when this will launch, the company is only saying next year — but if you’ve invested in a high-end audio setup and own an Xbox One, just know that things are about to get a lot better. Microsoft is trying to turn Cortana into the digital assistant of your dreams with a new AI bot called Calendar.help. 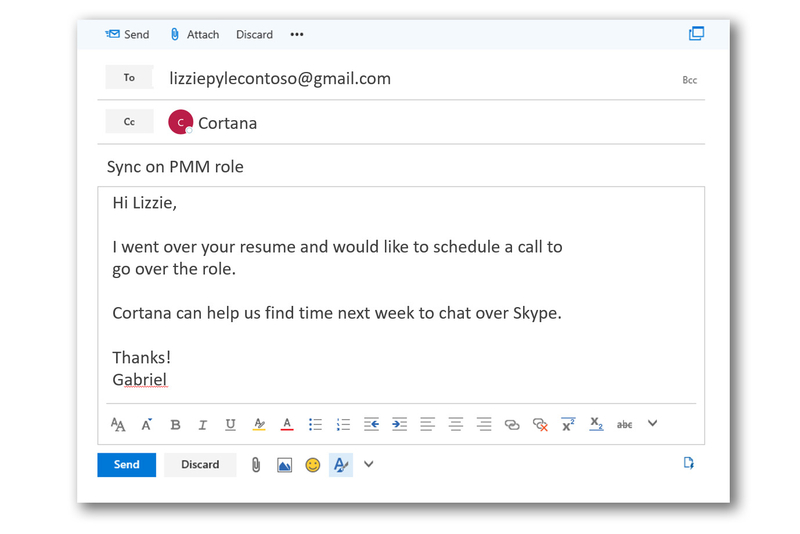 The beta service requires an invitation, but once signed up, you link it to your Outlook, Google or Office 365 calendar apps. Then, when it’s time to schedule a meeting, send an email to attendees and Cc: Cortana. The message can include natural language like “sometime next week” or “make this a Skype meeting.” From there, it’ll look at your calendar and contact other attendees by itself to find the best time for everyone. If this works as well as it sounds, it could be the useful (and ego-stroking) helper bot that busy folks without the cash to pay a human assistant have been waiting for. “All interactions are natural and conversational — as if a real-life assistant was coordinating the meeting,” Microsoft says. It adds that it’s powered by both machine and human intelligence, meaning that Microsoft employees might intervene when the machine can’t handle the job alone. Microsoft launched the bot at its AI day in San Francisco, where it also revealed a Cortana-powered Harmon Kardon speaker to rival Amazon’s Echo and Google Home. As mentioned, you’ll need to join a waiting list to get Calendar.help, and Microsoft says it’s favoring “those who frequently schedule meetings with people outside their organization.” That means Office 365 business customers may get first dibs, but the program should roll out more widely in the days to come. Microsoft is partnering with the (soon-to-be Samsung-owned) audio company Harman Kardon to launch a speaker with its Cortana personal assistant built in. Described as “a voice-activated speaker,” a short teaser video shows glimpses of a (rendered) cylindrical design not too dissimilar to Amazon’s Echo. It also takes cues from Google Home, with a display atop fashioned after Cortana’s familiar blue circle that shows when the assistant is thinking. Unfortunately, the teaser video is all we have to go on, and that only tells us the device is “coming in 2017.” It seems a pretty safe bet that it won’t be the only speaker with Cortana built in, though. Microsoft is making a big push into the “internet of things” with the Cortana Devices SDK, hoping to partner with many manufacturers to bring the assistant to various devices and appliances. In a blog post announcing the SDK, Microsoft describes Harman Kardon as “one early device partner,” noting that the speaker company will have “more news to share next year about their plans.” Still, if you were holding out for a Microsoft version of the Echo or Home, this looks to be the closest you’ll get to it for some time. We could still see a Surface- or Microsoft-branded speaker at some point, of course, but for now, Microsoft seems content to rely solely on partners to take on Amazon and Google. Microsoft doesn’t just want its Cortana in your phone or on your desk — it wants the voice assistant to be a mainstay in your smart home. As part of a WinHEC presentation, the company’s May Ji has revealed that Windows 10 Creator Update will bring Cortana to Windows 10 IoT Core devices with screens. Combined with longer-ranged voice detection (key to Microsoft’s Home Hub plans), you wouldn’t have to be anywhere near a PC to use the digital helper — you could ask your thermostat about the weather, or add an appointment to your calendar through your fridge. Those concepts aren’t new, of course, but Cortana can sync with your phone and Windows PC on a level that isn’t possible with most smart home devices. The Creators Update arrives in spring 2017, although you won’t necessarily see Cortana-equipped appliances shipping at the same time. Hardware makers will still have to integrate the new Windows 10 release into their products, so it could take some months after that before you’re upgrading your home. Even so, it could be a big deal when it arrives. Most smart home equipment doesn’t have direct access to an advanced voice assistant — this would make the technology virtually ubiquitous. If you both have a state-of-the-art surround sound setup and are in the Xbox One Preview Program, this week should sound pretty great. That’s because the update adding support for Dolby Atmos is rolling out to the Xbox One and Xbox One S, according to Microsoft’s Larry “Major Nelson” Hryb. It’s via Bitstream pass-through and was originally promised back in October. It isn’t clear when this will make its way to everyone’s console, however, so your dreams of marrying next-gen audio with your video format of choice might take a bit longer to materialize. Microsoft is following Sony’s lead and temporarily dropping the price on the Xbox One for the holiday season. Now through Christmas Eve you can save $50 on all One and One S bundles, which could make grabbing another game or a spare controller a little bit easier on the wallet. Hell, even if you aren’t looking for a game console specifically, the Xbox One S makes for an incredibly solid UHD Blu-ray player. A post on Xbox Wire says that the deals are available at places like Amazon, Best Buy, GameStop, Microsoft Stores and Walmart’s website, so maybe call ahead before you sally forth debit card in hand. Dropbox has long said that it wants to be available on whatever platforms people use to get things done. That’s why it has done so much to integrate with Microsoft Office over the years, for example. But the latest place you’ll find Dropbox is nonetheless unexpected: The company just launched an app for the Xbox One. Once logged in, you can upload screenshots and pictures taken with Kinect straight to your Dropbox. You can also stream any video files in your Dropbox to the Xbox One — something that’ll definitely be handy for those of us who have a large video library but no seamless way to play it on the big screen. You can also upload files from USB drives connected to the Xbox One or upload files from other universal Windows 10 apps you may be running on your console. And other applications (Dropbox specifically mentioned VLC) can see flies in your account and access them. The rather unusual project was born at Dropbox’s annual hack week, when the entire company takes 5 days to build and show off a wide variety of projects. Some have nothing to do with actual shipping projects, but many others end up making their way into Dropbox in one way or another. “At this year’s event, one of our engineers decided to prototype the app, and demo’d it to other Dropboxers, showing how we can bring a new Dropbox user interface within Xbox that is optimized for TV screens and for gamepad navigation,” Huyn said. Of course, Microsoft’s own OneDrive has been available on the Xbox One for some time now, but millions of people are using the service, so giving them an option to easily get their files on the Xbox is a smart move, even if it’ll likely be something of a niche app. If you want to give it a shot yourself, the app is live today in the Xbox Store. Skype’s live translations are no longer limited to fellow internet callers. If you’re part of the Windows Insider Program, you now have access to a Skype Preview release for PCs that will translate calls to conventional phones, whether they’re cellphones or landlines. If you need to contact a hotel where no one speaks your native tongue, you might have a chance of holding a conversation. The recipients get a notice that Skype is recording and translating the call, so they have an opportunity to hang up if they’re particularly concerned about their privacy. The expanded translation works with nine languages (Arabic, Brazilian Portugese, English, French, German, Italian, Mandarin, Russian and Spanish). And since you’re calling phone lines instead of other voice-over-internet users, you’ll need some Skype credit to reach anyone who isn’t using a toll-free number. Still, if you’re willing to live on the edge, it’s an important step. There are more improvements if you don’t care for these features. You can forward Skype calls to a traditional phone line if you won’t have access to the app. It’s also possible to capture and share video messages, whether or not a contact is online. You can better manage conversations, too — it’s possible to both mark conversations as read and introduce people on Skype by sharing contact info. It may take some time for these updates to launch in a polished release, but that patience may pay off. Microsoft has announced November was its best month ever for consumer Surface sales. In a blog post, the company said more people are switching from Macs to Surface devices than ever before following the “disappointment” of the new MacBook Pro, particularly among professional users. Shortly after the new MacBook Pro launched, Microsoft launched a promotion offering up to $650 trade-in credit towards a new Surface Book or Surface Pro 4. Microsoft also unveiled the Surface Book i7 and Surface Studio in October, and the all-in-one desktop in particular has been met with positive reviews. Microsoft has announced that Cortana for iOS is coming to the U.K. and that the company is readying a significant design overhaul based on user feedback. Cortana is to Windows what Siri is to macOS, but Microsoft’s voice-activated virtual assistant has been available on iOS in the United States for precisely a year now, allowing PC users with Apple devices to sync their reminders, notifications and so on between the two platforms. Along with the iOS app’s imminent U.K. debut, Microsoft took the opportunity to announce an upcoming overhaul for Cortana on mobile that replaces the existing design with a cleaner, simpler interface, and introduces quick actions for putting frequently used functions front and center. Checking things like calendars, news, and weather, and setting and viewing reminders will become accessible with a tap on the main screen. As well as clearer full-page answers to queries, Microsoft says the updated Cortana app will also be significantly faster. Cortana for iOS is a free download for iPhone and iPad. Microsoft wasn’t clear about when exactly Cortana will be making its way to the U.K. App Store, but the redesigned app is said to be arriving on both sides of the Atlantic “in the coming weeks”.